New Balance 860 v6 are stability cushioned running shoes. 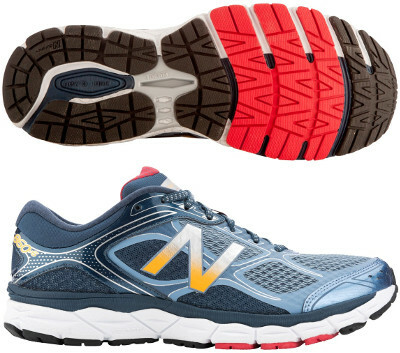 The reliable New Balance 860 v6 upgrades the typical model which has no outstanding features but a great performance. Almost all popularity within stability running shoes from the american brand goes to its bigger sibling 1260 v5, but the 860 v6 deserves more attention because of great value for money: maybe not latest technologies on board but smooth pronation control and plenty of durable cushioning. Upper from its predecessor 860 v5 was thinner and more trendy but raised several concerns about durability so current one takes a more classical approach with open mesh in the forefoot for improved breathability and fused overlays to provide good consistency for secure fit. Lateral straps that wrap the midfoot are no longer tighted via lace system but internally placed. Midsole structure is based on what is already working well on its counterpart for neutral runners 880 v5 with firmer ACTEVA® LITE layer on top of durable ABZORB® foam plus medial post for pronation control. Drop goes down from 12 to 10 mm for smoother transition. Outsole keeps a simple configuration focused on flexibility in the forefoot and durability with harder Ndurance® rubber in more exposed areas while T-BEAM shank delivers torsional stability through the midfoot.